The seismic shift in global energy production was powerfully in evidence today (April 21), when all electricity in the UK was produced for a 24-hour period without burning a single shovelful of coal—for the first time since the industrial revolution. Britain led the world into industrialization in the 18th century, when machines powered by coal—and eventually by electricity produced from burning it and other fuels—began to take over from manual labor. Ever since then, billions of tonnes of coal have been incinerated to keep power grids feeding the country’s homes and businesses. 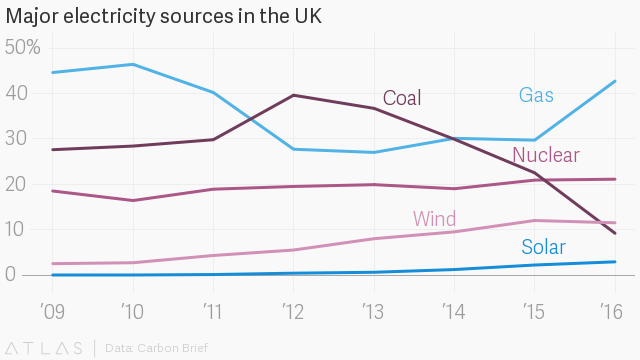 As recently as 2014, the UK was still getting 40% of its energy from coal. The day without coal won’t be absolutely confirmed until late on the 21st. But National Grid said there were no plans to bring any of the UK’s coal plants online for the day—barring a failure somewhere else. Statistics from Drax, which collates data from a number of sources to create a picture of the UK’s energy system, showed that in the last days coal has produced only a tiny fraction, sometimes less than 1%, of the UK’s total electricity consumption. But it’s never stayed at zero for 24 hours before. The lion’s share of electricity comes from gas-fired power stations. Nuclear accounts for about 20% and wind, the biggest renewable contributor, produced more power than coal for one month for the first time ever last year. Worldwide, coal is still used on a massive scale, especially to power emerging economies like China and India. If the planet is to have any hope of staying below warming targets set in 2015 in an effort to avoid catastrophic climate change, those countries will need to find alternatives too.